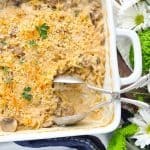 This Dump-and-Bake Beef Stroganoff Casserole is a simplified, shortcut version of the classic favorite -- and you don't even have to boil the pasta! 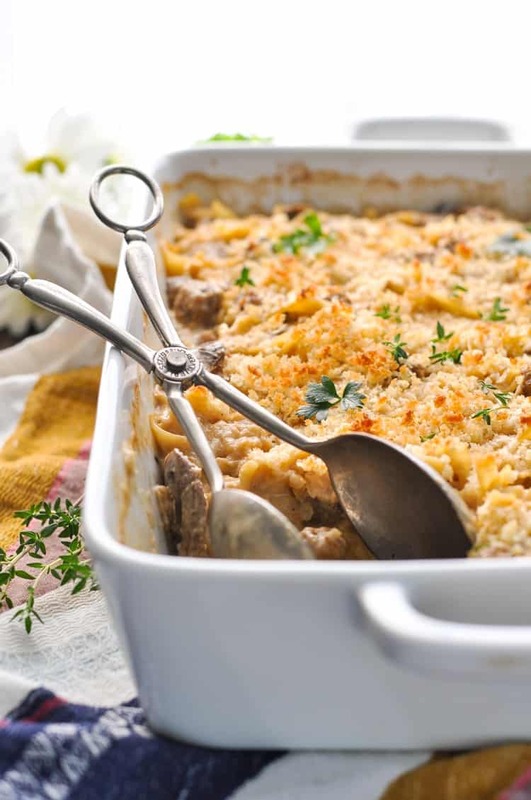 This Dump-and-Bake Beef Stroganoff Casserole is a simplified, shortcut version of the classic favorite — and you don’t even have to boil the pasta! Thanks to a few special tricks, this one dish dinner comes together in about 10 minutes, and it tastes even better than the original! Did you grow up with Beef Stroganoff too? My mother is Russian, so maybe it’s just a cultural thing? Either way, this is the comfort food of my childhood! For those of you that weren’t necessarily raised on the hearty meal, “бефстроганов” is a Russian dish of sautéed pieces of beef in a sour cream sauce. My mom always served it over egg noodles, but I’m sure that there are other folks who pair it with mashed potatoes, spaghetti, rice, or bread. It’s warm, cozy, satisfying, and absolutely delicious! With fall on the horizon and cooler air (hopefully) in the forecast, I had a hankering for Beef Stroganoff and I wanted to be able to share it with my own family. As usual, however, I didn’t want to spend the time on a busy weeknight sautéing beef, boiling pasta, and stirring a sour cream sauce in a skillet. Not only is that tedious, but just imagine all of the dishes that I’d have to wash at the end! No, thank you. 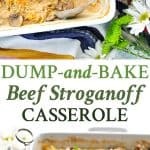 Instead, I borrowed the same flavors and ingredients from my mom’s original Beef Stroganoff and transformed them into a dump-and-bake dinner that I could throw together in 10 minutes and then pop it in the oven. Even the uncooked noodles go straight into the dish — no boiling necessary! Now that’s my kind of cooking. If you’re like me and you feel pressed for time but you’re not willing to forego a home-cooked dinner, then I hope that you’ll give this a try. My modernized-and-Americanized version of Beef Stroganoff is (dare I say it?! )…even better than the original! Cooking for a Smaller Family? 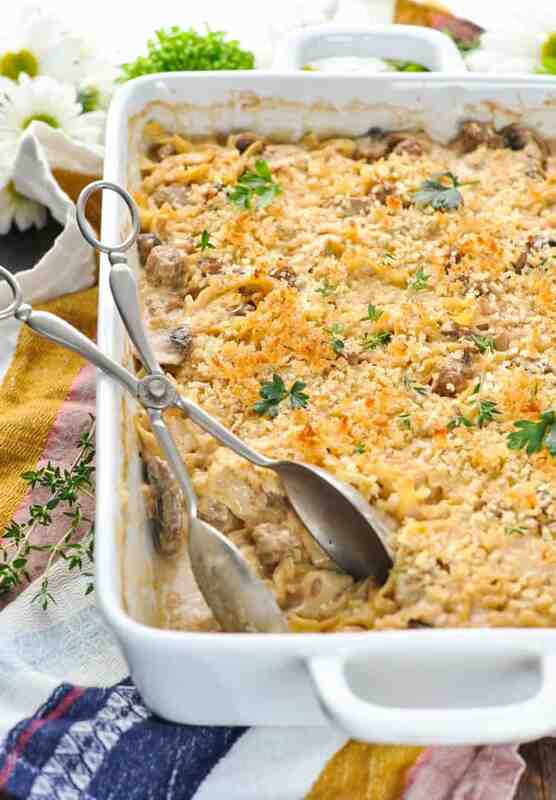 Cut all of the ingredients in half and bake the casserole in an 8-inch square dish. Cooking instructions remain the same. I like to use the Earth’s Best frozen beef mini meatballs, which are even smaller than the traditional cocktail-size frozen meatballs. They just blend into the casserole best. I find mine at Target or Whole Foods, but they’re available online and in other stores as well. 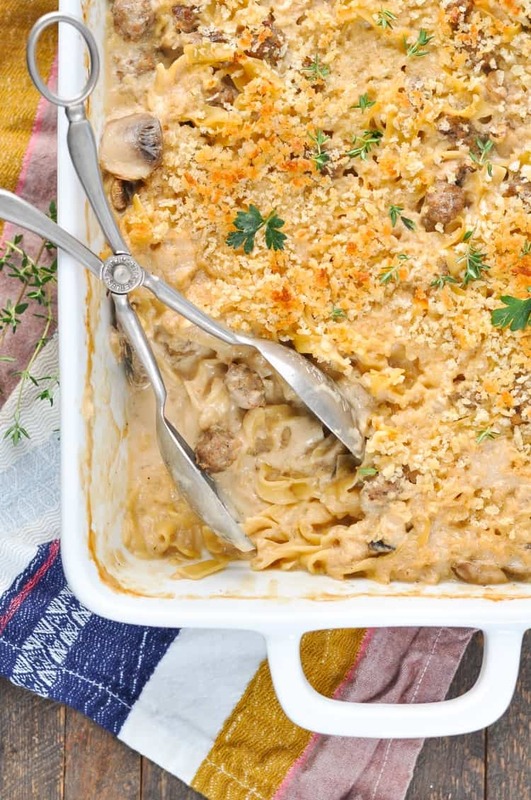 I do not recommend freezing this casserole because of the dairy and noodles I don’t think it would work well. Leftovers – the noodles will swell because they will absorb more moisture and liquid which will affect the texture, also the creamy sauce will thicken as it cools. You could try re-heating with a little added water or broth but beware of the texture change. In the prepared dish (or in a separate bowl), whisk together the Alfredo sauce, beef broth, Worcestershire sauce, and sour cream until smooth and completely combined. Stir in the uncooked noodles, onion, meatballs, mushrooms, and garlic. Cover tightly with aluminum foil and bake for 30 minutes. In a small bowl, mix together breadcrumbs and melted butter. Sprinkle breadcrumbs over casserole and bake, uncovered, for 10 more minutes (or until topping is golden brown and pasta is tender). *I like to use the Earth's Best frozen beef mini meatballs, which are even smaller than the traditional cocktail-size frozen meatballs. They just blend into the casserole best. I find mine at Target or Whole Foods, but they're available online and in other stores as well. Previous Post: « Introducing Simply Mailed: a Quick-Prep Meal Planning Service by The Seasoned Mom! While I didn’t have beef stroganoff a whole lot growing up, I did have it every once in a while, and it’s a dish that I crave in my adulthood. I love this easy version, Blair! I’m definitely trying this out. I love that it’s ready to go in just 10 minutes and so full of flavor! This recipe sounds easy and delicious. I tried your 5 ingredient honey garlic chicken recently. It is definitely a “keeper” and a recipe I will use again. Wonderful! I’m so glad that you enjoyed the chicken, Diana! 🙂 Thanks for letting me know! Easier beef stroganoff is 1/2 can mushroom soup, 1 bag cooked egg noodles, 1 pound cooked ground beef. Mix together, and then add in one 12 ounce carton French onion dip (I use Krogers brand) done. You don’t have to even heat up the soup because you are putting it into hot noodles and hot cooked beef. Easy. I use this recipe for late nights from working and hungry family! Every “easy” beef stroganoff recipe uses cream of mushroom soup. Kudos to Blair for a different approach. I’m mixing mushrooms , 1/4 diced red onion , 1 clove diced garlic , mushroom soup and beef broth, salt , pepper and the noodles bake it top with buttered bread crumbs bake about 10 more min. uncovered and it’s ready. To me, “easier” is not having to cook the noodles or beef before hand! I was looking for a recipe where I could throw everything in, pop in the oven, and do something else while the oven does the work! I did not even know about the mini meatballs, so thank you. I’m always looking for new easy weeknight meals! This looks like perfect comfort food! My mum loves beef stroganoff so I am sharing this with her now! Yum! My 13 year-old daughter who hates everything but Mountain Dew and chocolate, told me I could open up a restaurant with this recipe. Thank you, thank you, thank you! How well does this recipe freeze? Could I sub plain greek yogurt instead of sour cream? We rarely buy sour cream but always have plain greek yogurt on hand. I wanted to make sure it wouldn’t curdle or do anything weird if I swapped. Thanks! Hi Blair, I live alone and am trying to figure out the base of the recipe for a small amount. I think I could do everything but the noodles and bread crumbs, then divide into small portions for one and freeze. Thaw and add noodles and bake according to directions. Do you think this might work? Hi, Beverly! Yes, I think that will probably work. I’m not 100% sure about how the sour cream will freeze. I just don’t want your sauce to curdle or break apart after freezing. That said, usually when you combine the sour cream with other ingredients, it freezes fine. I say give it a shot in a small quantity first (so that you don’t waste your ingredients if it doesn’t work out). The other alternative is to prepare it by cutting the ingredients in half and baking in an 8-inch square dish. That will give you leftovers for another meal or two, but it won’t be an overwhelming amount of food for one person. Hope that helps, and enjoy! Back to the freezing question. I like to make extra dishes to store in my freezer for quick meal nights. What about freezing this dish before it is baked? Do you think I could use cream cheese in stead of sour cream? Thank you for all your great recipes. We really enjoy them. Hi, Francine! Maybe! 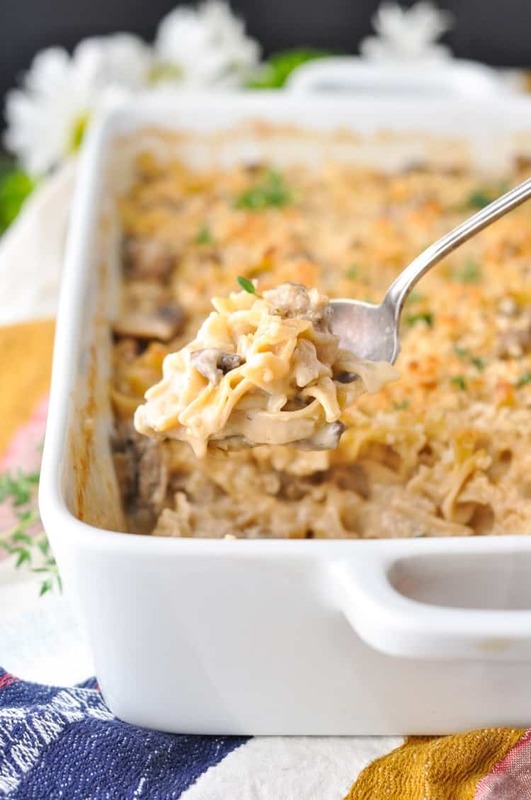 You’ll want to dice the cream cheese into very tiny cubes so that it blends with the rest of the casserole and you don’t have chunks or blobs throughout. Also, maybe try adding it to the dish towards the end when everything is warm so that it melts right away? Let me know if you give it a try! I tried what you said and it came out great. Thanks for the help. Well, I tried this recipe last night, as I said I would, and it was also a big success! I love a few things about your recipes, Blair: 1) that they are so super easy yet tasty (those two adjectives don’t usually go well together in recipes, I’ve found); 2) that you give instructions on how to half the recipe, and 3) that you typically give cup measurements as well as ounces. I stumbled on your website via a “Take Them a Meal” sign up, and I am so glad I did; thank you! Can I sub frozen hash browns for the noodles? We aren’t big on noodles in my house. Hi, Erin! Unfortunately, I don’t think that the hash browns will work as a substitute unless you drastically decrease the amount of liquid in the dish. The uncooked pasta absorbs the liquid as it cooks in the dish, and also releases starches that thicken the sauce. The potatoes will not do exactly the same thing, so you’d have to play around with the liquid ratio to get it right. I’ve just never tried it with potatoes, so I can’t say exactly how the recipe would change. Why frozen onions? I have tried freezing onions in the past and found them mushy when thawed. Can I use fresh onion or dried onion instead? Also, I don’t find that the frozen onion is mushy when used in a casserole, because it would bake and become soft anyway. 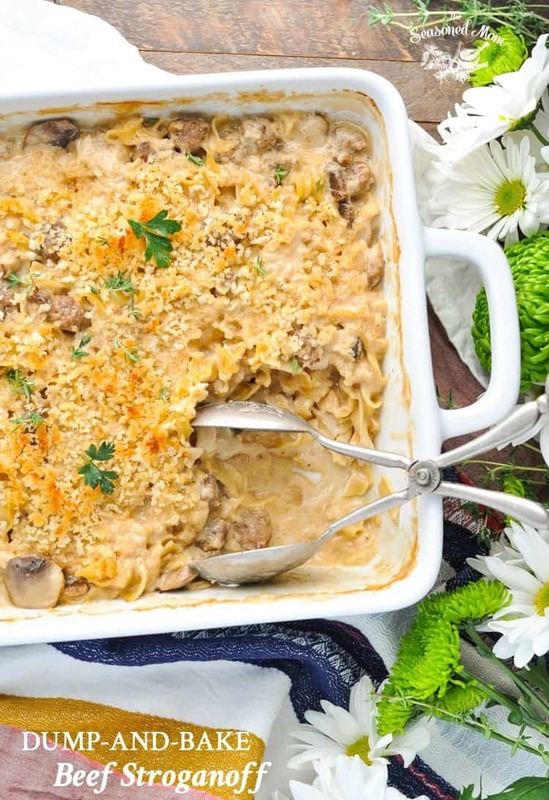 Beef stroganoff is ultra comforting…I love this quick and easy version! Thanks for the yummmmmy recipe. You’re so kind to share it with us.